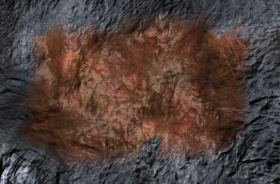 Iron Ore is one of the raw ores available from mining asteroids. It can be found on planets and moons, occuring as nodes underneath the surface. It can be processed in a Refinery or an Arc Furnace to produce Iron Ingots. It has a distinctive "rusty brown" appearance, similar in appearance to Nickel Ore. It can be distinguished by looking at its shade and its impurities; it is a darker shade of brown than Nickel and has some blemishes.